A lifetime of regular exercise and eating a healthful diet that includes enough calcium, such as Living Calcium Advanced helps build and maintain good bone health. Living Calcium Advanced provides the recommended daily amount of calcium, along with a broad spectrum of vital minerals and nutritional cofactors to help support healthy bone density. Living Calcium Advanced contains MCHA (Microcrystalline Hydroxyapatite), a highly absorbable, body friendly form of calcium, derived from BSE-free Australian, grass fed, free-range cattle. Vitamin D and vitamin K complex, including vitamin K2 derived from Natto (fermented soybeans), are included to facilitate optimal calcium absorption. In addition, Living Calcium Advanced contains essential minerals, organically bound to a whole food matrix, that also support bone health. Finally, since healthy homocysteine levels have been associated with healthy bones, Living Calcium Advanced includes a specialized blend of nutrients that support healthy bone metabolism by maintaining normal homocysteine levels. 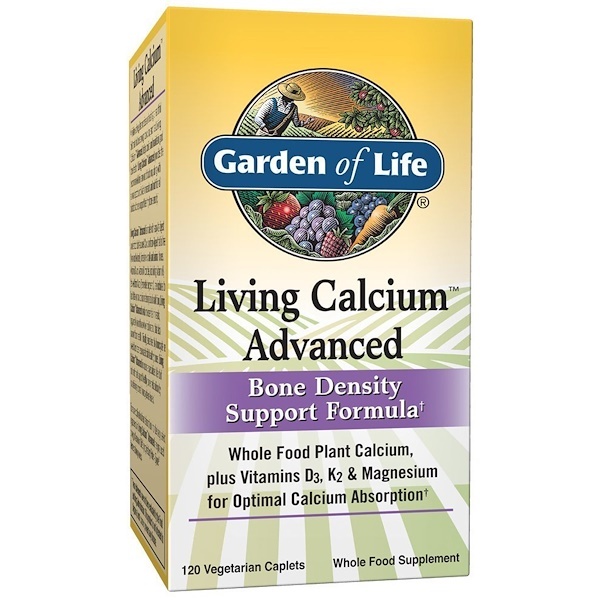 To ensure optimal nutrient absorption into the body, select ingredients in Living Calcium Advanced are produced through Garden of Life's proprietary Poten-Zyme fermentation process. Living Nutrients, like those in our Living Calcium Advanced, are better for your body because they are more like food than isolated vitamins, but with guaranteed potency in a whole food source. Living Nutrients are body friendly, containing bioactive components that the body recognizes. Our Poten-Zyme fermentation process makes them easy on the stomach, and because your body recognizes Living Nutrients as food, they are better absorbed and more body-ready than less expensive isolated vitamins and minerals. Adults take 6 caplets daily with food. May take 2 caplets, 3 times per day. Not intended for children. Microcrystalline cellulose, stearates (vegetable source), vegetable coating, sodium croscarmellose, probiotic cultures. *Living Nutrient produced using the Poten-Zyme fermentation process. 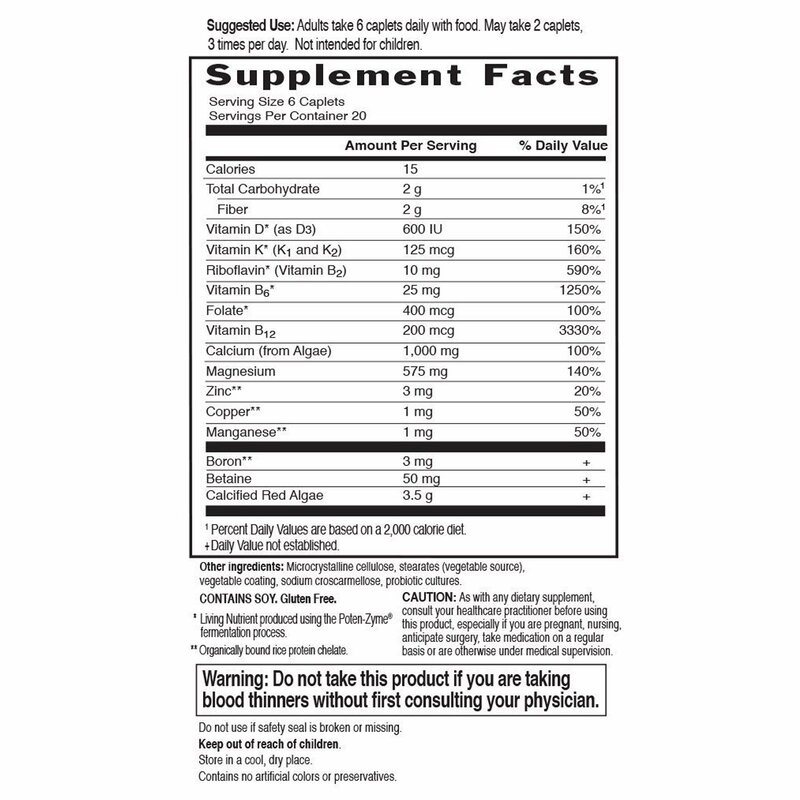 **Organically bound rice protein chelate.